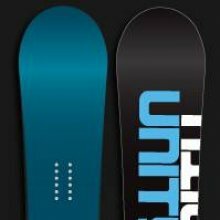 The Unity Dominion is one of those rare big mountain boards for those that live for carving groomers at high speeds and deep powder. This is surfy like a new school long board shaped ride meaning it floats well in powder, quickly pick’s up speed but isn’t problematic engaging in a tight turn or even occasional slash. The hybrid camber shape of the Unity Dominion is going to be pretty much like a normal camber board with a decent amount of rocker in the nose. It will feel like a shorter camber board than it is which is good because the sizes run on the larger side. The board is well built, the price is good and the ride is excellent. We had a lot of fun on this aggressive big mountain/freeride board. What is nice about the Dominion is all waist widths run on the narrow side so it make’s it a little easier to turn. On Snow Feel: This isn’t for everyone but if you like big boards on groomers for carving and just bombing this is a very fun board. It feels like a blend between the Arbor A-Frame and the Rossignol Experience when making it work. It’s stable between the feet and it’s got a very surfy off the back foot kind of feel to it. You don’t want to ride this like a twin. Powder: Like we said above this is a performance longboard style shape meant to be ridden bigger and not like a little slashy powder board. It’s about speed and superior floating but can make pretty good tight turns in the trees or tight chutes for it’s size. It’s much better bombing or making big carving turns in the deep stuff. The bottom line is the nose is higher than the camber between the feet so you don’t have to fight that hard on your back foot to stay afloat. Turn Initiation/Carving- This is just shy of being moderate. You have to be an accomplished rider who likes the feel of a hard carving board but doesn’t like the difficult feel many of these type of boards can offer up. Wide arcing to carving turns is where the Dominion shines but it’s ok when making short radius/quick turns. The Dominion has the same great return on a carve as a camber board. The only thing is it turns a little more like a shorter board. What we mean by this is the 168 feels more like a 164 or even a 162. Speed: Now the base went for sturdy instead of super high end but it’s still a pretty fast base. When you combine that with the damp ride and stiff flex it still equals excellent speed. Uneven Terrain– Not bad but it can get a little cranky at end of the day snow you see at your local resort on weekends and holidays. Weight- It doesn’t feel light but it does feel sturdy. Flex: we’d say somewhere between aggressive and stiff but not the stiffest board we came across. Switch: This is a very directional flex with a decent bit of rocker in the nose. It’s all about riding one way. Jumps: Great for big jumps on natural terrain but it’s all about methods and grabs. It’s a lot easier to land with the nose going forward than the tail. The rest doesn’t really matter….. we can say this is a great ride. We try to get as many images of the Unity Dominion, but forgive us if they're not all there.